If you’ve spent much time with me here on Relishing It, you already know that I love spending time in the kitchen, working my way through an intricate recipe. Not much makes me happier than pouring through ingredients in the afternoon sun, with the sound of my little ones playing in the next room. Yes, that’s my heaven. But of course, the sun doesn’t stream through the windows much here in January, and– let’s be honest– kids generally have a way of needing something every 15 minutes. So I often have to be more realistic, and for that I love turning to one-pot meals. 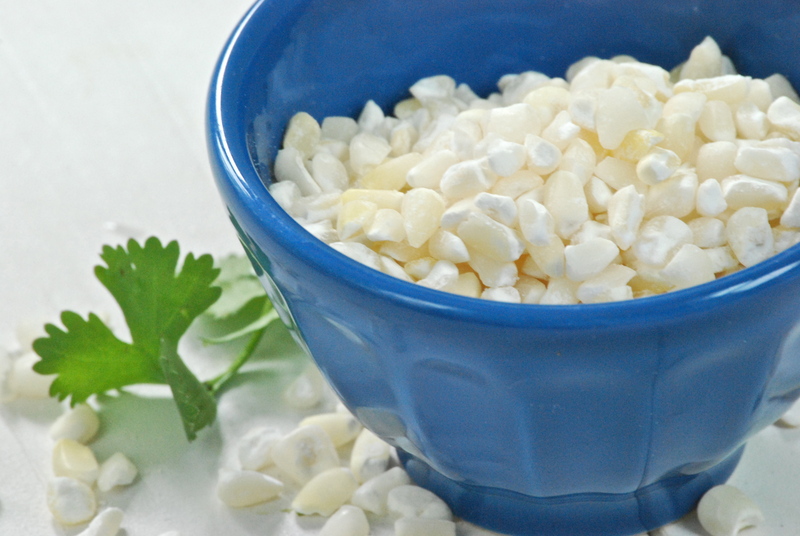 This white chili is a great meal that doesn’t require much attention. 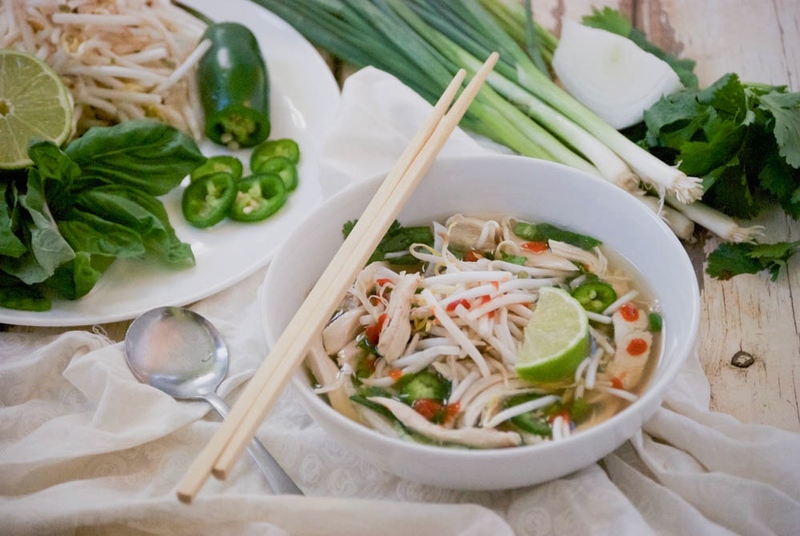 It’s hot, healthy, delicious, and best of all, mostly tends to itself. Perfect for a cold Sunday afternoon when you’re busy playing inside, or (lucky you) when you get a chance to just settle into the couch with a good book. We eat more than our fair share of chili here in the cold months. I like that it’s relatively healthy, and that I get a chance to experiment with different ingredients and flavor combinations. Last weekend I made a batch with cubed beef, dark chocolate, toasted cumin seed, an oyster stout beer, and dried ancho chiles that I toasted and ground myself. Loved it! But enough about that (for now). 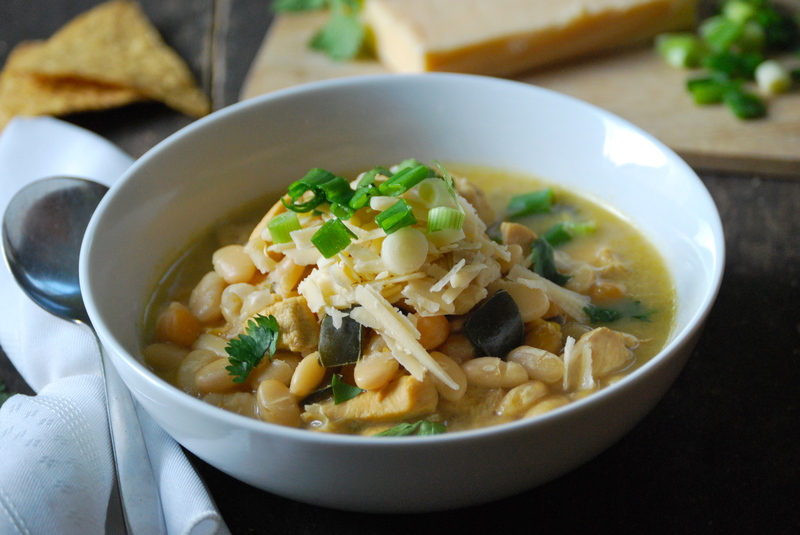 Today’s recipe is for my favorite version of white chili. I prefer this style to not be too heavy. If you’ve ordered it in a restaurant, you probably know what I’m talking about. To get the right consistency, I smash a few of the beans as a thickener, and then use evaporated milk to give it a nice creaminess. 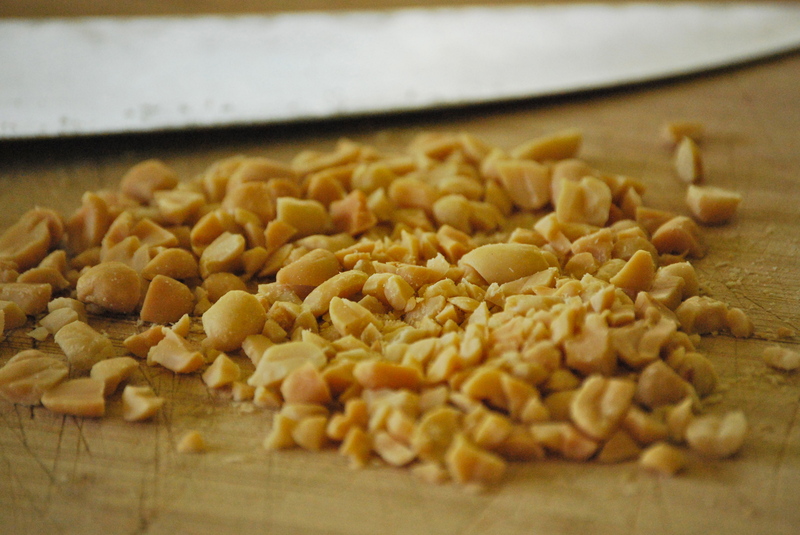 The chickpeas have a wonderful, firm texture that holds up well, while the white cannellini beans add a nice silkiness. The combination is sublime. 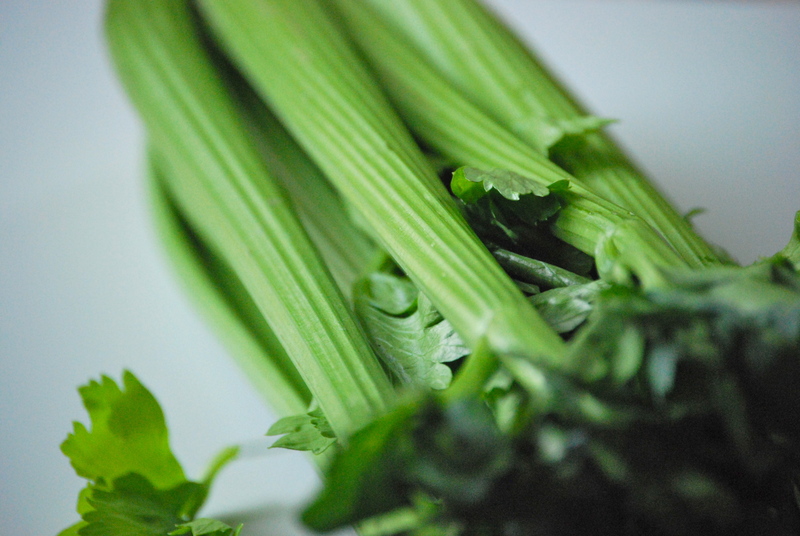 A generous squeeze of lime into the pot for the finish gives it vibrancy and freshness. Note 1: If you choose to use shredded roasted chicken, do not add it to the chili immediately or it will fall apart. Add it after you purée some of the beans near the end of the cooking time. Make sure it has enough time to warm through. Note 2: Soaking the beans overnight in the refrigerator is one way to prepare the beans ahead of time. However, if that isn’t possible, place the dried chickpeas and cannellini beans in a large pot and cover with a few inches of water and a couple teaspoons of salt. Bring the water to a boil. Cover and remove from heat and let sit for at least two hours. At this point, check the beans for doneness. If they are not quite done, you may want to bring them back to a boil once again for a few minutes to soften up a bit more (I find that the chickpeas take a little longer). If you add them to the chili and they are not fully tender, they will soak up a bit more of the liquid. When they are your preferred texture, drain and set aside. In a large Dutch oven over medium-high heat, add the olive oil. When it is hot, add the chicken and a sprinkle of salt and pepper. Brown for a few minutes until cooked through. Remove the chicken from pan. To the same pan add a bit more olive oil, if necessary, and the poblano pepper, jalapeño, onions, and garlic. Sauté for a few minutes until somewhat tender. Return the chicken to the pan, along with the cumin and coriander. 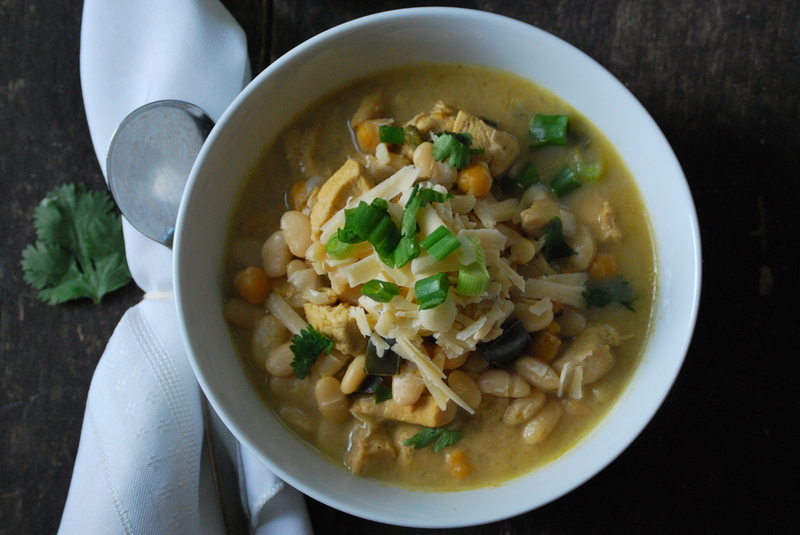 Cook for 1 minute and then add the chicken stock, chickpeas and cannellini beans. Bring to a boil. 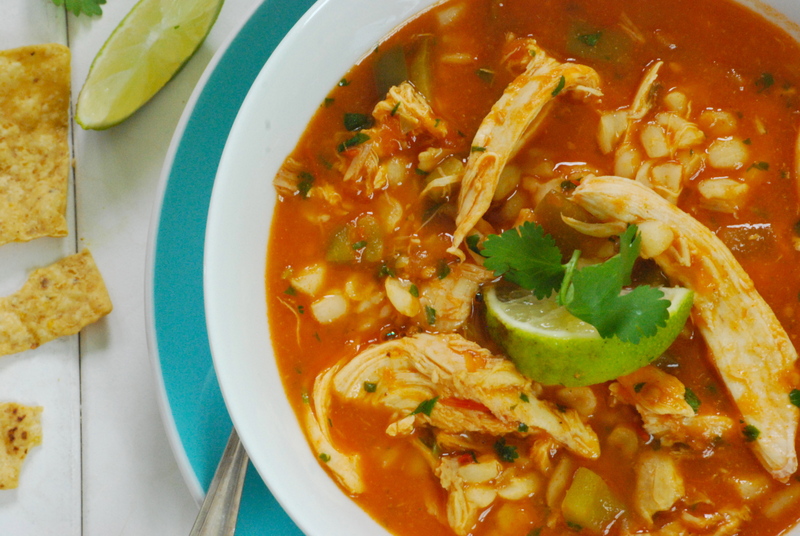 Reduce heat to low-medium and cook for about 30 minutes – 1 hour. More if the beans need extra time to soften, less if they don’t. When the texture of the chili seems right to you, remove about 1 1/2 cups of beans from the pot and place in a shallow bowl. Use a fork to smash the beans and make smooth. This will help thicken the chili naturally. Return the smashed beans to the pot. Add the evaporated milk and cook uncovered for a few minutes longer. Add the juice of 1/2 of a lime to start, and more if you choose. Taste and re-season with salt and pepper, if necessary. Enjoy! Let’s all give a big cheer for the fact that the weekend has arrived! It is going to be a cold one here in Minnesota with highs below zero farenheit, and I am seriously excited! Why am I looking forward to the coldest temperatures of the last four years? Not surprisingly, because I start thinking of what meals to make while we’re nuzzled in at home. I’ve eyeballed a few of my favorites, but haven’t quite decided on which to make. This Paprikash is the perfect cold-weather comfort food. 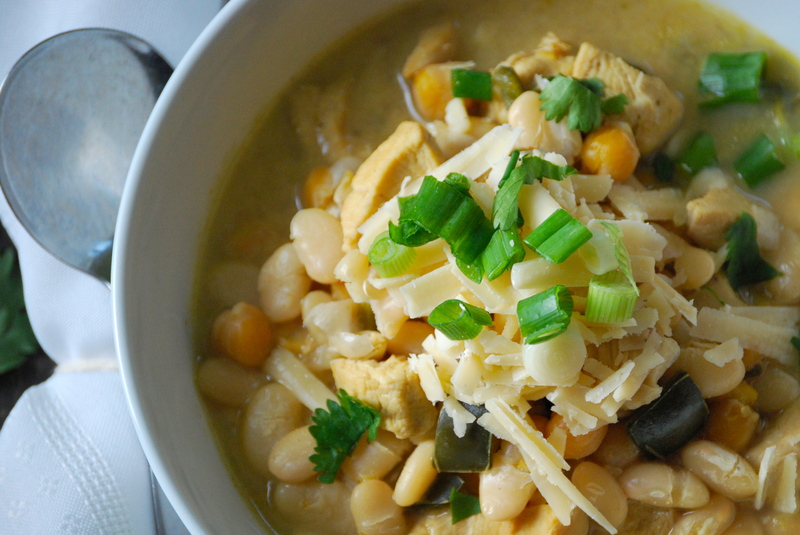 And this African Peanut Soup would certainly warm us up. Then again, a hot sandwich made from this Cheddar and Stout Meatloaf is also tempting, or maybe these Roasted Root Vegetables . Since we’ll likely be house-bound the whole weekend, I may even make this Ragu alla Bolognese on Sunday night, as Aria has been begging for pasta. Bring on that frigid north wind! 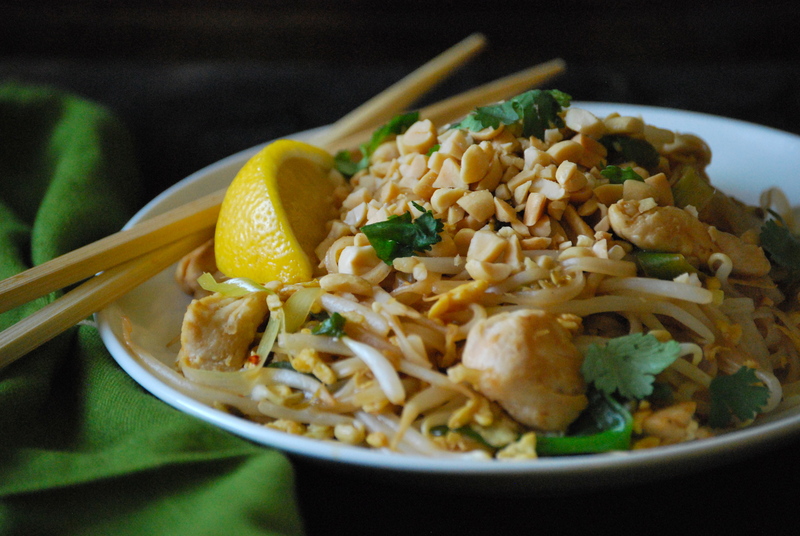 Then again, this pad thai is also a perfect cold-weather meal. 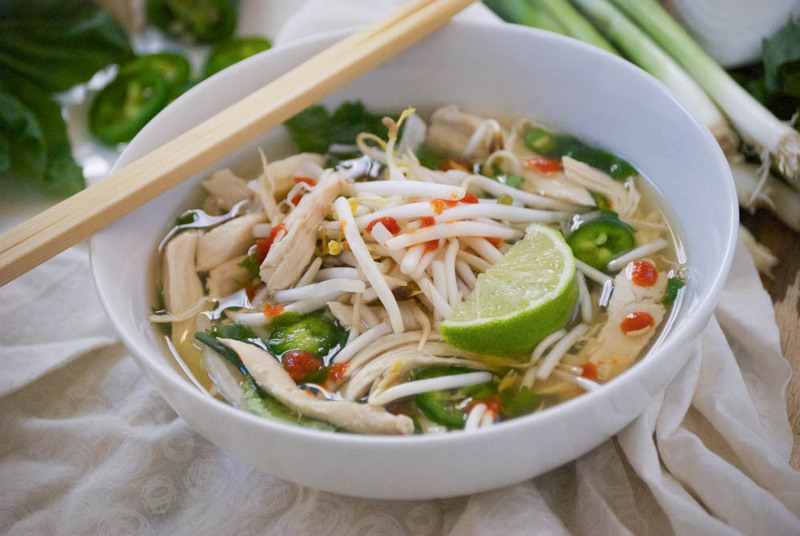 While it may sound odd, there’s just something about a piping-hot Asian noodle dish that reminds me of Winter in St. Paul. I suppose it’s because we often trek to our favorite Thai restaurant for bowls of spicy coconut curry or pad thai once the season turns. My kids– like most, I suppose– can be frustratingly picky eaters at times. But they love ethnic food, and for that I am so thankful. I never really had the opportunity to try ethnic foods while growing up in western North Dakota, but once we moved to a large city, I was hooked. And Thai cuisine is one of my favorites. 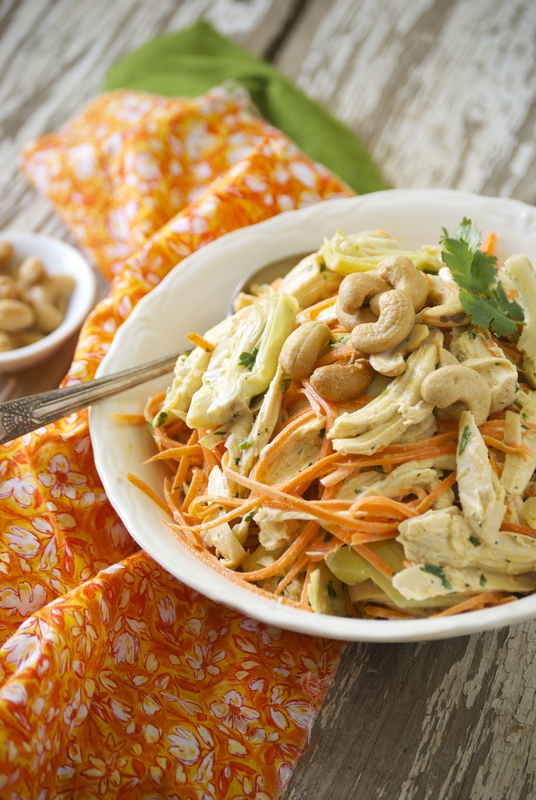 While we still love to eat pad thai at our fantastic local hole-in-the-wall restaurant, I decided to look for a recipe to make this amazing dish at home. It was surprisingly difficult to find one that perfectly captured the sweet richness of the peanut sauce, as well as the ‘tang’ I was looking for. I tried several from various cookbooks, but was always disappointed. In the end, I tried my own hand at it, and it turned out to be exactly what I was after. 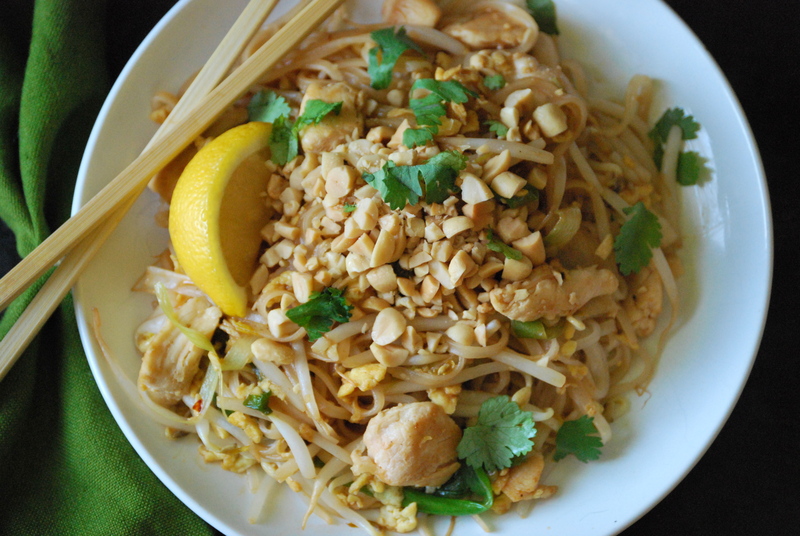 I also love that I can make pad thai healthier at home. I like to use brown rice noodles, rather than the white; and I buy good locally-sourced free-range chicken that has been properly raised. 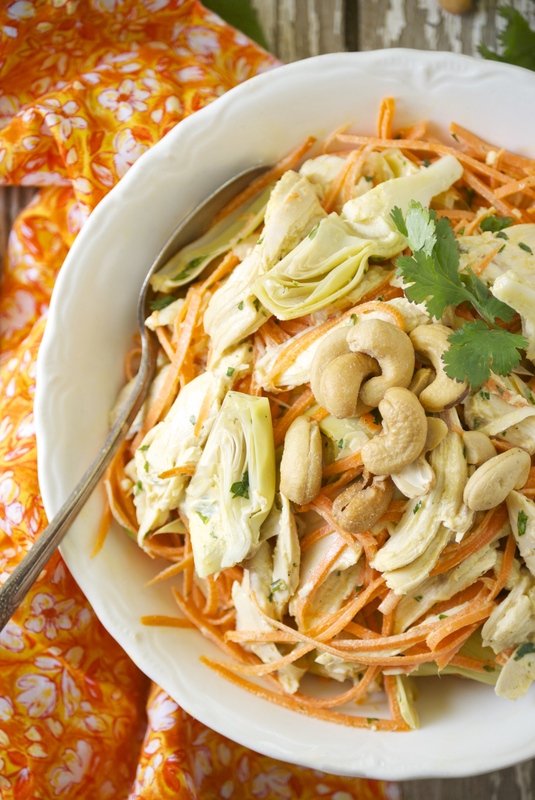 You can also make it with shrimp, or leave the meat out and go vegetarian. 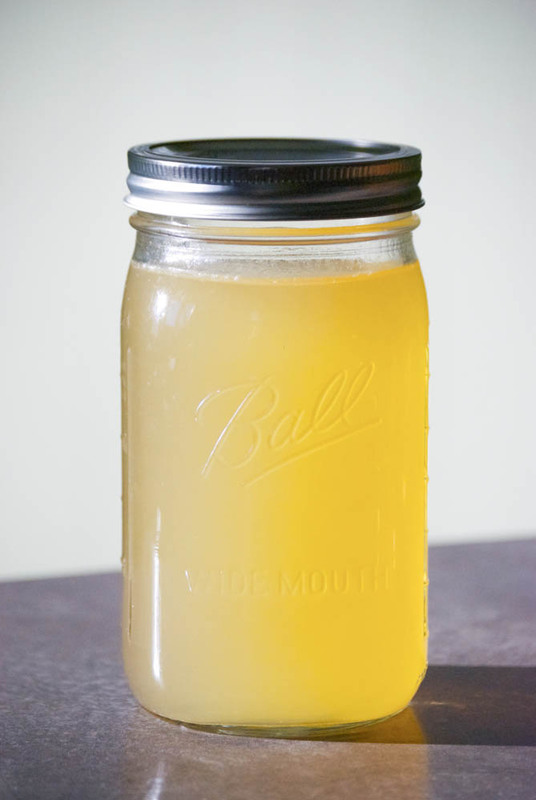 This version has just the right amount of sweetness, perfectly balanced by vinegar. Feel free to customize it a bit to fit your exact taste. The one bit of advice I’ll give about making this dish, is to be prepared and work quickly. This dish doesn’t take much time to get on the table, but, once it’s done you’re going to want to sit down and eat it right away. 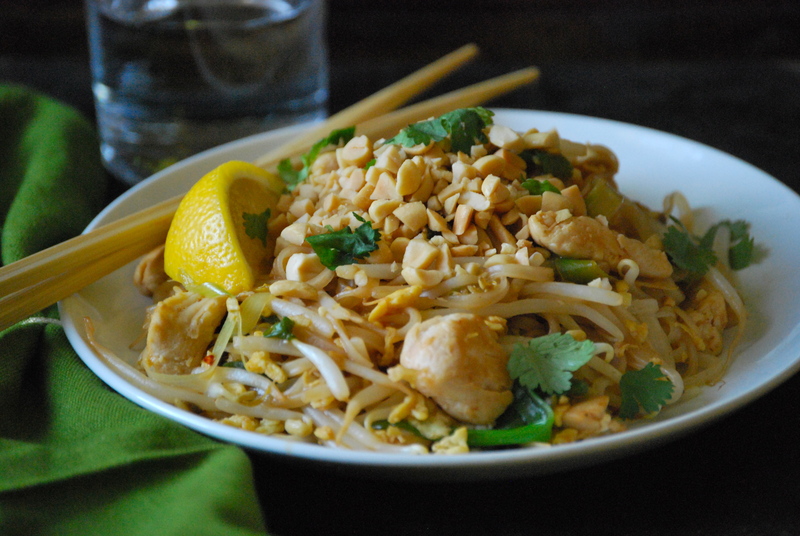 If there’s one rule about eating pad thai, it’s that it doesn’t have a long table life. 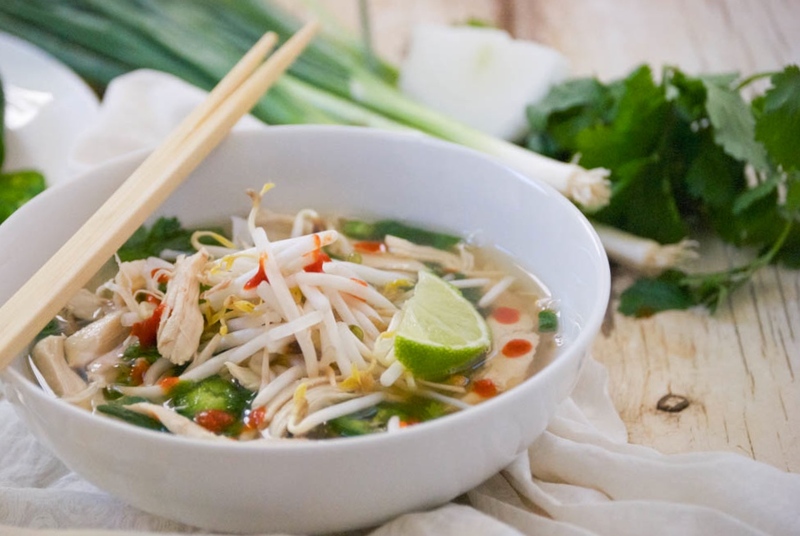 Eat it while the noodles are steaming hot, or they’ll cool and begin to clump together. Give it a try, and enjoy your weekend! In a small bowl, mix the hoisin sauce, tamarind concentrate, rice vinegar, and fish sauce together. Set aside. In another small bowl, add the two eggs and mix with a fork. Set aside. 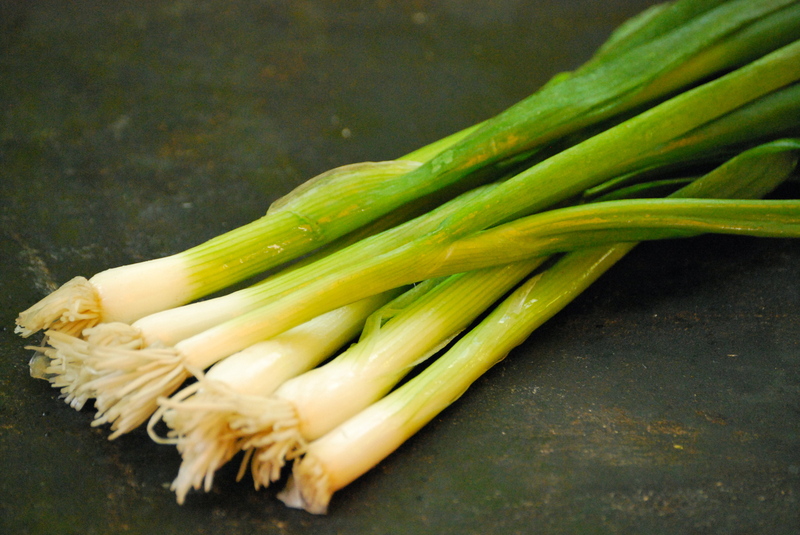 Prepare the green onions by cutting them in half, and then slicing them thinly or at a diagonal — however you prefer. In a 12-14 inch skillet add a bit of olive oil and begin the cook the chicken over medium heat. This will not take very long, as it should be sliced a bit thinly. Meanwhile, add the rice noodles to the boiling water. Cook for about 8-10 minutes, or until the noodles are al dente. Make sure not to over-cook them, as they will turn to mush rather quickly. While the noodles are cooking, push the chicken to the outside of the pan. Add a bit of olive oil to the center and scramble the eggs. 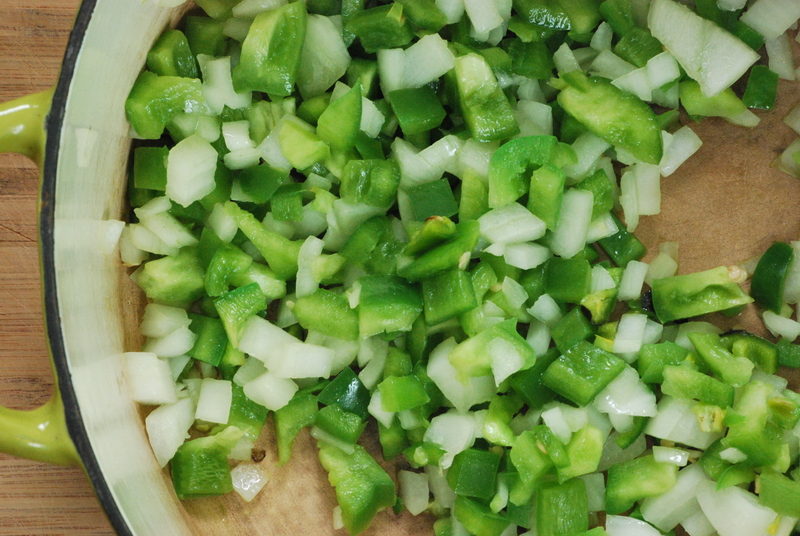 When they are scrambled, and about 2-3 minutes before the noodles are done, add the green onion. Then a minute later, the sprouts (you’ll want these to remain crisp, but still get warm). Pour the sauce into the pan, as well. Stir. Make sure to reserve some pasta water. Drain the noodles when they are done. And quickly add them to the pan. 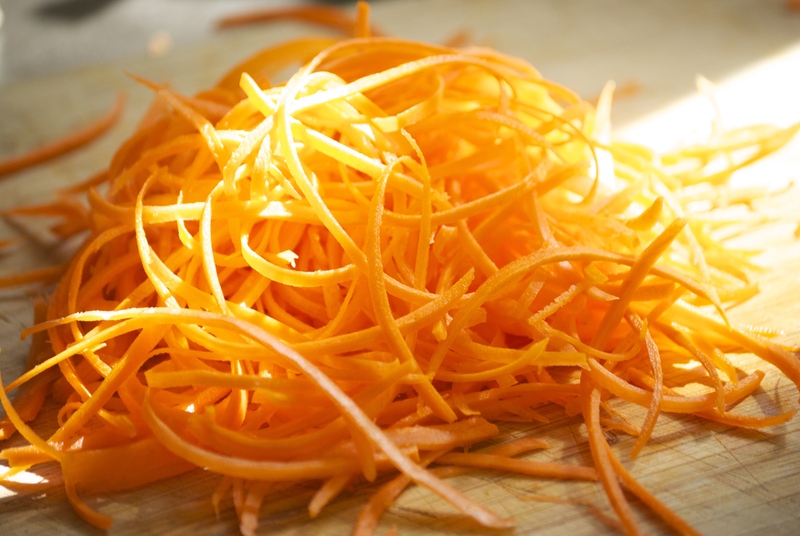 Using tongs, begin folding all of the ingredients together. Add a medium ladle of pasta water to loosen the mixture up. Add more if needed. 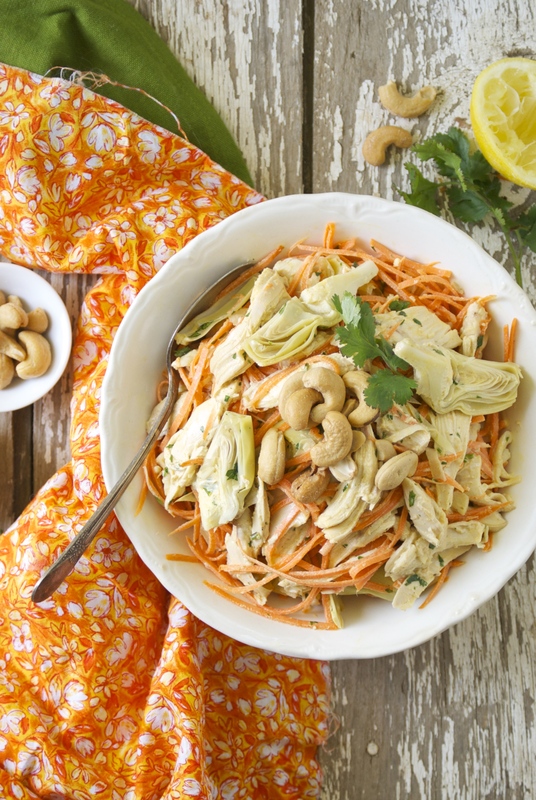 When everything is combined, mound onto a plate and garnish with peanuts, cilantro, lemon, and Thai chiles and serve with sriracha sauce, if you can handle the heat. Enjoy! 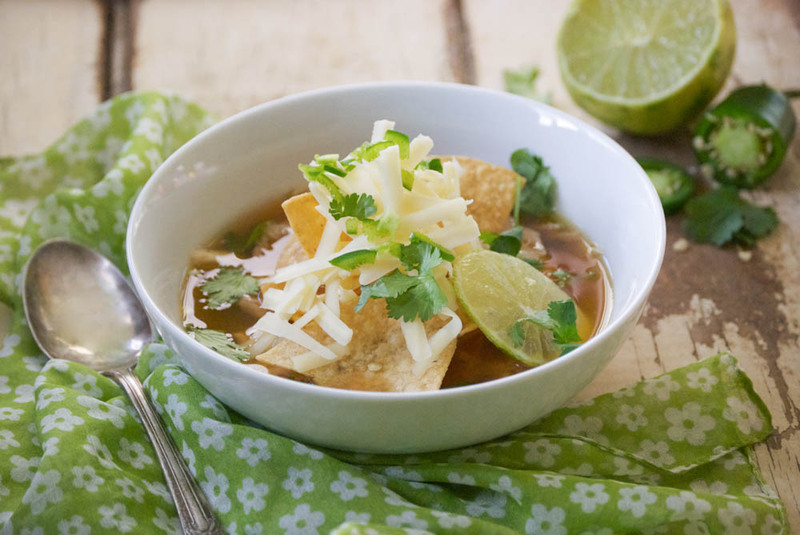 If you haven’t noticed yet, I’m all about soups. Just take a look at the soup section here for proof. It’s not just that they’re generally hard to mess up, and that they come together quickly, but there’s just something so satisfying about a good soup. To be honest, soup is one of my favorite things about living so far north. It’s one of the reasons I have a hard time saying goodbye to Winter. I love sitting down with my family to a big kettle of hot soup loaded with vegetables, grains, or legumes. 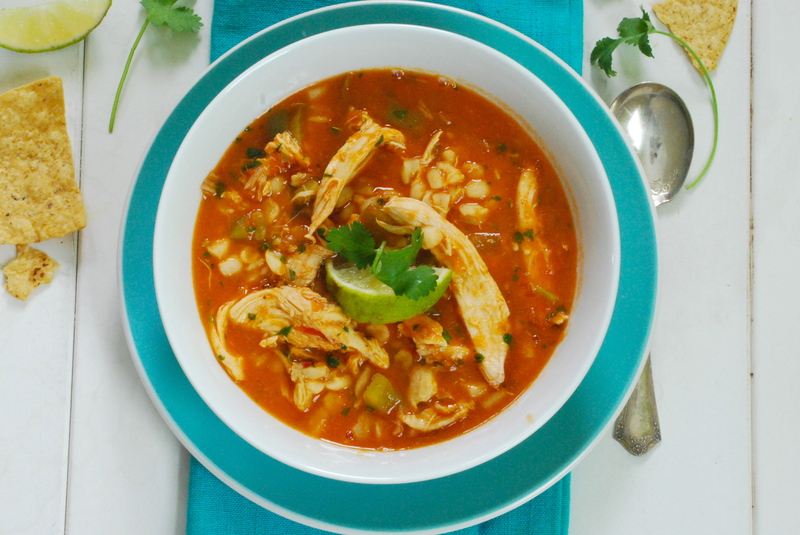 And I love to try different spices– to see how they meld together in the broth. 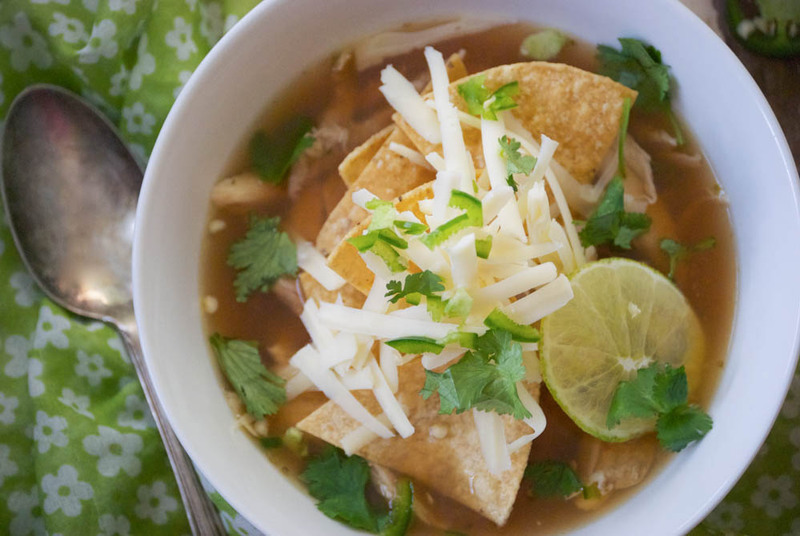 Since we eat soup so often during Winter (several times per week), I try to keep it healthy. These are our everyday meals, after all. You likely know that I splurge on occasion and make a meal that isn’t exactly low in the calorie count. But for the food that nourishes us every day, I try to be a bit more moderate. 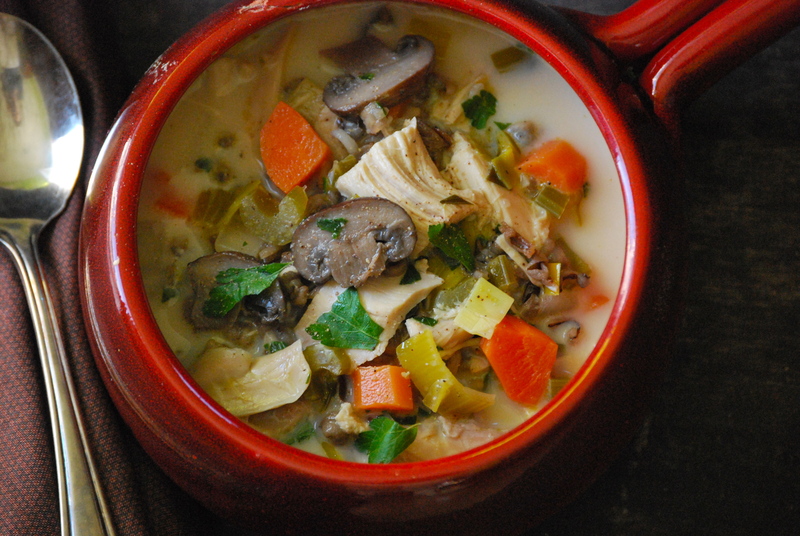 My version of wild rice and mushroom soup is light, yet still packed with flavor and nutrients. It’s far removed from those thick, goopy versions– laden with flour– that you often find in restaurants. As an aside, it took me years to convince my husband that the stick-to-your-spoon soups are overrated. He’s finally come around. To keep the soup lighter, I like to use evaporated milk. It makes it creamy, without the heaviness of actual cream. And ‘yes’, you can always use real cream instead. If you do so, just make sure to add it at the end so it doesn’t curdle. And if you really prefer a little more thickness, I recommend making a roux from cornstarch and water. Again, add it near the end of your cooking time. 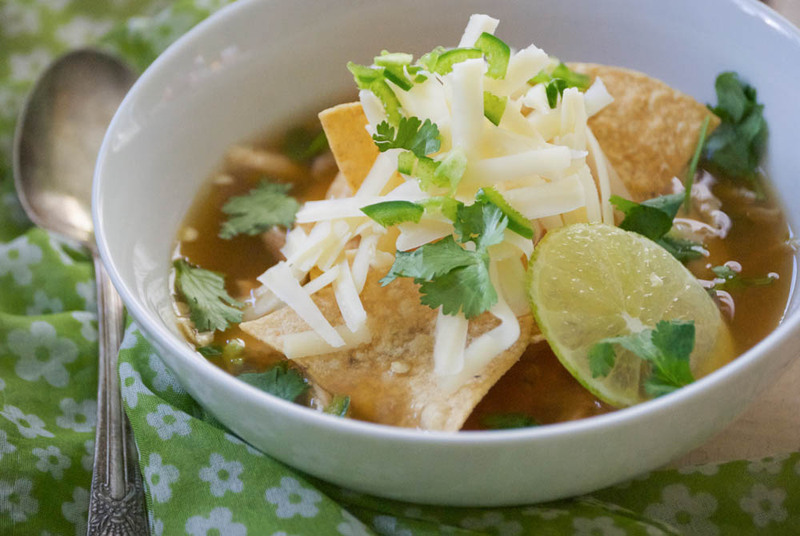 This is the perfect soup for making a few things ahead of time. 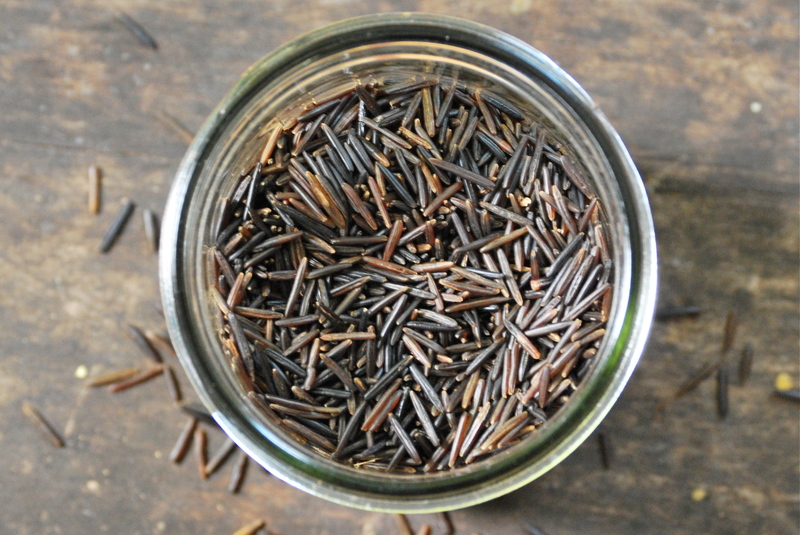 Both the chicken and the wild rice can be prepared in advance and refrigerated. If you do it this way, the soup really comes together in a cinch. One last thing to keep in mind here– and I guess I mean to generalize this to all of my recipes– but pay attention to the salt. If you look back through my other recipes, you’ll see I usually don’t give precise measurements for how much salt to add. Salt can make or break a dish. A quote by chef Thomas Keller has stuck with me– and I’ll paraphrase– if you can taste the salt, you’ve added to much. Salt should enhance the other flavors, but you shouldn’t taste the salt. 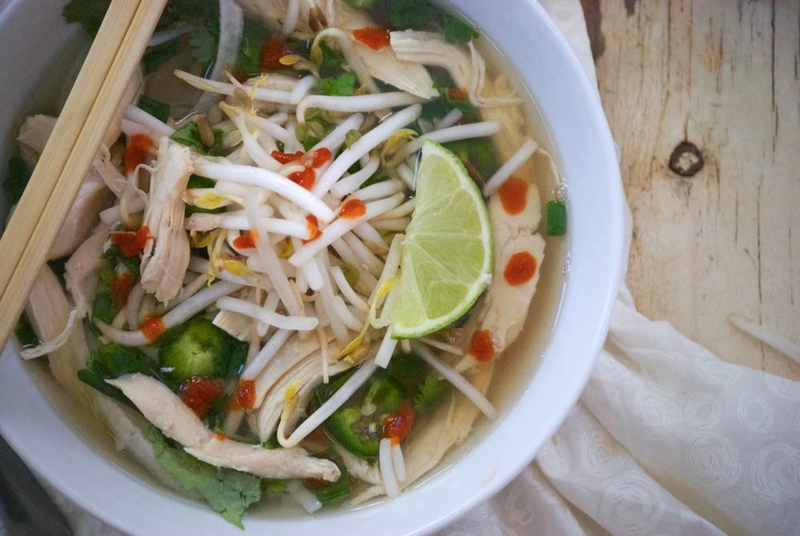 My point is, since every broth and roasted chicken contains different levels of salt, you’ll have to decide how much you want to add. Taste, taste, taste! Cook the wild rice according to directions on package. Make sure not to overcook it; it will cook a bit longer in the soup. Heat the olive oil in a large Dutch oven over medium heat. 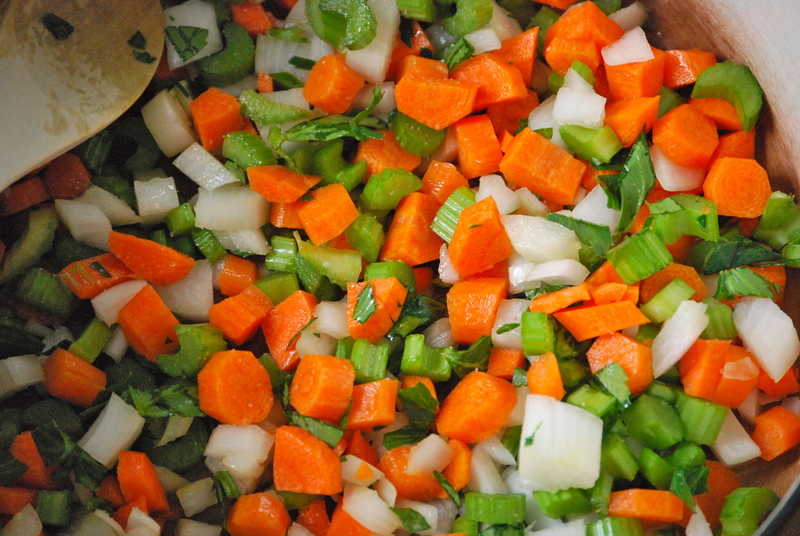 Add the onions, carrots, leeks, celery, and a pinch of salt and pepper. Sauté for a few minutes until vegetables start to soften, making sure to stir a few times. 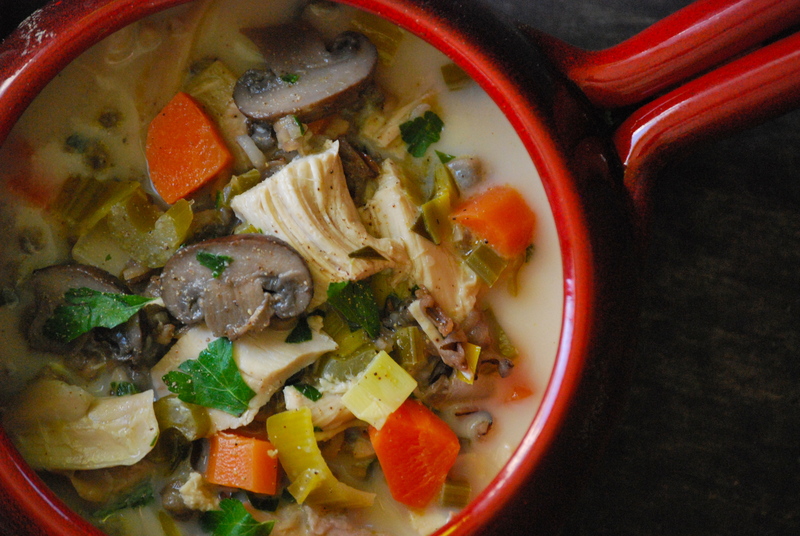 When the vegetables are somewhat soft, add the chicken broth, mushrooms, and rice. Raise the heat and bring to a boil. Reduce heat and simmer for about 20 minutes, or until all of the vegetables are tender. Add the evaporated milk, chicken, and sherry. Let simmer until the chicken has warmed through and the flavors have melded. Season with salt, pepper, and stir in the chopped parsley. Enjoy with a piece of crusty bread!